The Open Road has been hiring out a classic 1966 Ford Mustang for about 5 years, to the delight of hundreds of customers. However this received a number of criticisms: Like most American cars of the era it had an automatic gearbox and the all round drum brakes left a lot to be desired for customers used to modern braking technology. After a long search they have now found a Ford Mustang that answers these criticisms. 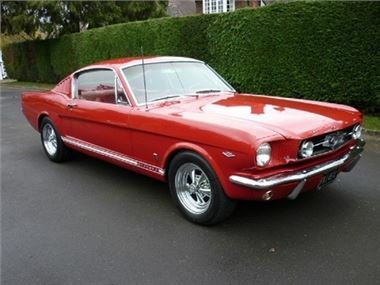 In October they took delivery of a superb 1965 Ford Mustang GT Fastback complete with the famous 4-speed top loader gearbox and with disc brakes fitted to all four wheels. At least now the driver is able to decide which gear to use instead of allowing an ageing autobox to make the decisions, and the all round disc brakes are a great improvement (even if still not up to modern brakes with ABS and ESP etc). This is a very striking Mustang in Rangoon Red with GT stripes down the side and fog lamps set in the front grille. It sits on a set of chromed Cragar alloys which look much better than the standard Rostyle steel wheels. The 289 cu in V8 has been replaced with a later 302 cu in engine complete with Edelbrock carburettor and chromed air filter. Internally it has a red and white Pony interior, fold down rear seat, a modern sound system and original factory fit air conditioning - which also works. It is a great car to drive, and throughout January, February and March they are working through the car, fixing a few minor niggles and making a few improvements so that the Mustang will be ready to go out on hire from April. The Open Road Classic Car Hire is now in its 15th year in business having started in 1997. It provides classic car hire in Warwick and Stratford upon Avon and around the wider areas of the West Midlands and Cotswolds. Since 1997 we have attracted customers from the whole of the UK as well as most of Europe and Scandinavia and as far away as the USA, Australia and Saudi Arabia. The previous 1966 Mustang automatic has been replaced by this 1965 but they plan to add a 2nd Mustang to their fleet later this year: a 1966 convertible also in red. Make sure you add the The Open Road web site to your favourites to keep you infomed of changes to the fleet and special offers.